It is true. I was never afraid of the dark. Until the light shattered in your death. And darkness fell. Life is love believing. Believing what? “Who has borne me these? What could I say about you? Not much. On surface you are gone. Or so they tell me. Passed away, they say. You are among the forgotten in the grave. Among the ones now passed. Passed where? Across the highways of my heart? You are not passed. No, not to me. You live among the dead, O precious soul. Souls are eternal, passing not. The years ebb off and still there is so much to say. About Love, and what entreats to love. Darkness does not forever shatter. If life is a pilgrimage, you beat me on it. Somehow eternity was elusive before you; paradise a theory. Now nothing else compares so real. If life is suffering, you make me know it. No suffering is vain loss, they tell me. But I have lost a lot. I have lost you. The depths I’ve suffered on your account do not compare to what I still would suffer for you. For to suffer is to love. Or else suffer we would not. But what is loss, when life eternal is your gain? Life is love believing; paradise, calling. If life surprises, you surely startled me. The odd were slim, or there were none. And yet you came. Hidden you remain, as though one unseen but near. How odd to be surprised by what one can no longer see. If life is dark, you have been my light. I have seen things on your account I would have never seen. I have seen God veiled in the breathless beauty that is the wonder of your life. Brief, but bright, the spark that seared my heart. If life is pain, the pain of loosing you does not rescind. To live each day is to live without you. Incandescent flames devour hope, yet love prevails. And this is sorrow slaved — for love is sometimes bonded pain. If life is poor, then greater poverty I will surely never know. Each thing one does not have amounts to harsh privation. No greater poverty will there be than losing you. Emptiness pervades. But what is emptiness, when it is filled with you? How is life poor, if you are rich in God? You fill my empty hands. If life is hope, then hope I will. I hear your cries in the empty sanctuary. 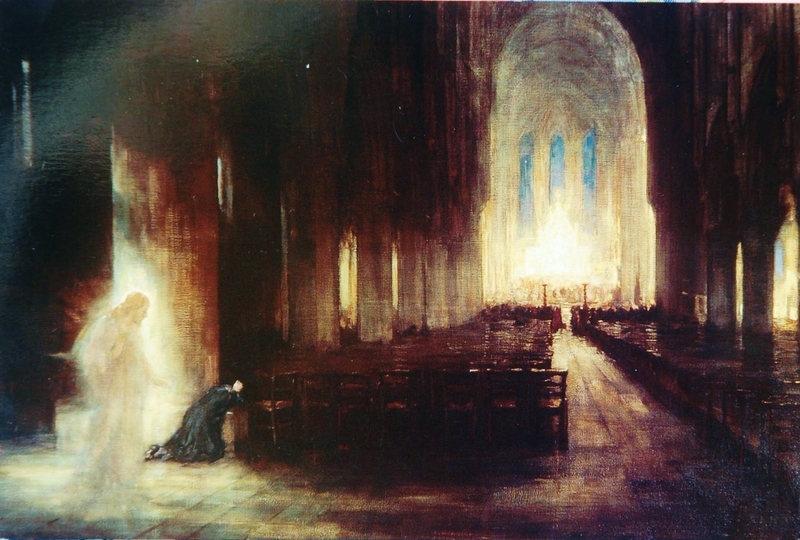 They tell me you are calling forth my soul; pilgrimage in the nave — altarbound. You lead me there. If life is joy, then no truer joy has there ever been in grief. O happy loss to love you gone. The dark? That writhing absence of the light? Now it does afraid me make — as if at times being here is to be so far from you. And far from God. Because I am. But in this shadowed absence light reveals itself most pure, most true. Perpetual night has never been — each night awakens day. Awake the dawn, my soul; call forth the Light. Hear and answer my prayer, O Lord; let me not weep in vain. But you are not in darkness, brethren, for that day to surprise you like a thief. For you are all sons of light and sons of the day; we are not of the night or of the darkness. Among the darklands of the night a new day is dawning nigh. Love perpetual keeps you vigil; a vision of your hidden life ennobles grief. Hidden love is the lamp that honors you at a graveside we do not see — hope perpetual is its flame. I shall love you absent in this life — that in life eternal we may meet again. Till then, the dark may veil the light, may wreck the heart, may push us to the brink of death. Let it run its course — ravage to purify. That there, on the precipice of this life, we might find the One who made the dead yet rise. And one day me. We pray. And memory, and grief, and grace, ignite the night. To purify.